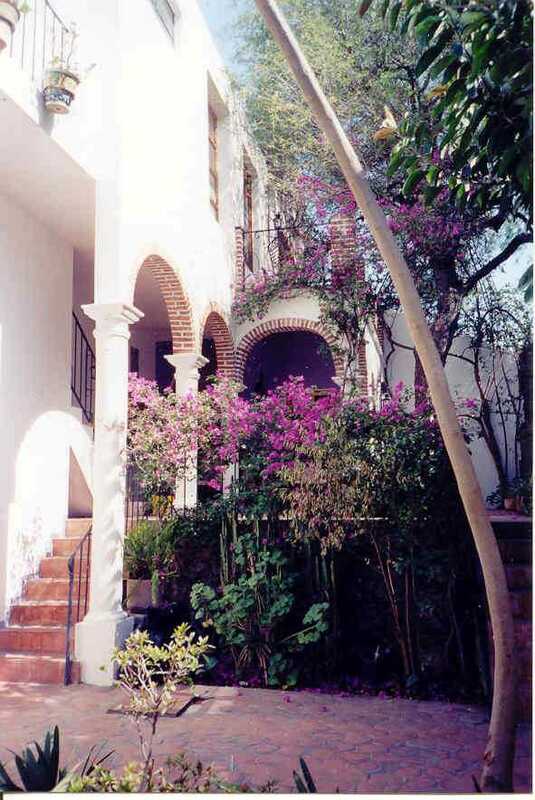 Over the Christmas vacation of 1998, we stayed for a week in the colonial city of San Miguel de Allende. This city of about 60,000 is set in the hills in the State of Guanajuato, three hours or so north of Mexico City. We rented a house (see below), but there are many hotels. San Miguel is a charming city that has the atmosphere of Old Spain or Tuscany. Many of the buildings date from the 1700s or earlier. It was established by the Spanish in the 1500s. San Miguel attracts many Americans because it is the home of three institutes, two for learning the Spanish language and one for the arts. There are many rich American retirees. Americans do not overwhelm the local charm, but guarantee that the city is well-equipped for travel services and restaurants. There appear to be no safety problems, at least when we were there. For example, it is routine to hail a cab on the street, which could be dangerous in Mexico City. The city is not equipped with resorts. A visitor to San Miguel needs to know that the goal is to visit one of the world's most charming places, a gem that is on the "World Heritage Sites" lists. There are no beaches, no deep sea-fishing, no drinks with umbrellas, no organized sociability. If possible, fly in and out of the airport in Leon-Guanajuato. American Airlines flies there from Dallas. This is about an hour and a half away from San Miguel by van -- closer than Mexico City and much easier to negotiate. The airport is beautiful, new and small; no crowds, no danger. We arranged through American Express in San Miguel to be picked up by their van at the airport. From the US, dial: (011-52-415) 21695; fax (011-52-415) 20499. If you don't have an American Express card to pay for the tickets over the phone, they will tell you very casually to pay for the tickets later in the week. The driver cannot take cash, but should be tipped. The going rate for a van ride is US$85. The van will give you door-to-door service. 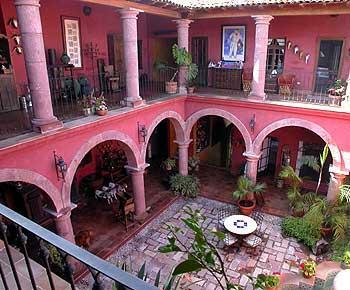 We stayed at the home of John F. Riley in San Miguel de Allende, Mexico. John Riley's phone number at 12 West 17th Street in New York 10011 is 212-883-3430. His e-mail is: RileyJ@dnb.com. (His home number in New York is 212-929-5317, but there should be no reason to call him there.) The phone number from the US is (011-52-415) 23788. (The address is 9 Pilancon.) The managing agent for the house is Ray Pieri, (011-52-415) 23846. (His address is Codo #9, 3rd floor.) Ray's office is (011-52-415) 23883. His fax is (011-52-415) 23558. The rate for Casa Riley was $695, even during the week of Christmas. John rents it out over 40 weeks a year, so it is important to contact him well in advance. It is a lovely house built in the 1700s and refurbished about 12 years ago by a Spanish ballet dancer. There is a courtyard and a garden, where it is possible to hang out and eat meals. The main floor has a living room, a dining room and a small kitchen. There is a master suite on the top floor, with a fireplace and an outdoor patio. There is another bedroom on floor half-way down from the main floor, with three beds and a small loft that can be used for some separation. The house is behind a locked gate, in a narrow street. The house is located in a residential area, a round-about 5-10 minute walk from the main square. The closest restaurants are a block or two away. Apart from restaurants, it is possible to cook at Casa Riley (of course, the tap water is not for drinking). Shopping means joining in Mexican daily life and poking around in near-by bakeries, tortilla shops, and corner groceries. The house includes a maid, Juana, who will cook if you arrange it in advance. We found her cooking to be as good as in any local restaurant. We would give her 100 pesos ($10), tell her what we wanted, and she would shop and cook the midday meal. (Once we had her do breakfast, and that was great, too.) She does not speak English but is friendly. Some of our favorite restaurants included: Aqui Es Mexico, Bella Italia (not just Italian food) and Bugambilias. Our very favorite was Tio Lucas. The food was great, and the live jazz in the patio superb. This was probably the most upscale of the restaurants we visited, but like all of them, it is very informal and the kids were at ease there. My favorite early morning espresso place (opens at 7:30 am) is in the Jardin (main square), corner of Hidalgo and Principal Del Correo. The town has ATMs in the main square, at the bank. We hit our US bank accounts at will! The temperature is ideal. During the winter, it was sunny all the time, with temperatures reaching the seventies during the day and cool at night (in the fifties). We are told that the weather is the same all year. It is never hot in the hills, but it doesn't cool off so much at night during the summer. Take a light sweater for the evenings. Given this weather, you won't encounter either air conditioning or heating. The town offers less in the way of "must-see" sights than it does a general relaxed atmosphere. Even random street scenes turned into beautiful photographs. A strong recommendation is to take a cab ride (or a walk) to "El Chorro," the beautiful colonial buildings at the site of a public spring. There is a lush near-by park, narrow streets that head up the hill, and a special atmosphere. Other sites are centered on the Jardin and the streets around it. Shopping is considered good by Mexican standards, but we loved visiting the Mercado Ignacio Ramirez for local handicrafts. The region also is known for porcelain, which is on sale inexpensively. One detriment to staying in a private home is finding somewhere to swim. Apparently, access to hotel swimming pools is possible on a daily basis, but we never arranged it. We did take a cab ride to "La Grutta," a modest restaurant alongside a hot spring pool out in the country. We don't recommend it. There is nothing special about the restaurant, or the swim. One thought we had, but didn't do, was to take a cab ride to Hotel Hacienda Taboada out in the country. This hotel is said to have a fine thermal water swimming pool and a buffet, each of which can be used for the day for a fee. Another resource is the Tourist Office. It is open during the weekday business hours (10am-3pm and 5-7pm; Saturdays, mornings only). Phone: (011-52-415) 26565. The manager of the office is Luis Antonio Villa. He is an enterprising young man (speaks English) who arranged our van back to the Leon Airport, as well as a van and driver to take us to Mexico City, Teotihuacan and Tula. This was our one extravagance, with the 32-hour trip costing $400 plus tip). I am confident he could have arranged any number of other excursions. His (parents') home phone is (011-52-415) 20534, and he can be reached there. Luis also mentioned that his family boards American students in their home when they are in town learning Spanish at one of the institutes. (My only reservation there would be that her location on Calle Insurgentes is a long walk from the Instituto Allende.) My feeling also is that John Riley's local manager, Ray Pieri (numbers above) is an enterprising contact and that this transplanted American could be a resource. As of August 2002, John Reilly's contact information is as follows. Consider asking him to be added to his email list because occasionally he offers the house at half price when there is a cancellation. The current weekly rate is $795. year-round sunny weather - "eternal spring". and a full-time maid to cook and clean. It is fully furnished. centrally located, a short walk to the center of town (five minutes). local Club de Golf allows weekly memberships. Tennis courts are also nearby. Artes. Also, there are several schools which teach intensive Spanish. Visit : http://www.casariley.com for pictures of the house. They report that it was very good, but because it is up the hill, it is a steep-two-block climb to get any where. Another bed and breakfast that came highly recommended was Casa de Liza (where the motto is, "Like Staying in an Impressionist Painting." During this trip in 2004, our friends' favorite restaurant in town was El Correo (across from the post office). They also like the Italian restaurant, Romano, which had delicious, inexpensive cuts of meat. La Unión was the place for shipping things home. In fact, between Guanajuato and San Miguel, they stopped at the village of Santa Rosa, which specializes in ceramics. There are no shipping options direct from there, so they were advised to take their things with them to La Unión and ship from there. We have never visited the old silver town Posos, which is nearby, or the famous mummies, also outside of town. Reports on the hot springs are mixed, but our friends enjoyed visiting the ones at El Escondido, some 8 kilometers outside of town. We have not been to Guanajuato itself, but it is said to be even more interesting the San Miguel, with fewer U.S. tourists. Our friends in 2004 were delighted with Quinta las Acacias, which also had outstanding food -- the best in town. Guanajuato is worth perhaps two full days. Nobody I know has gone there, but the famous Museo de las momias -- the Museum of the Mummies -- is outside of town. Courtyard, house of John Riley.